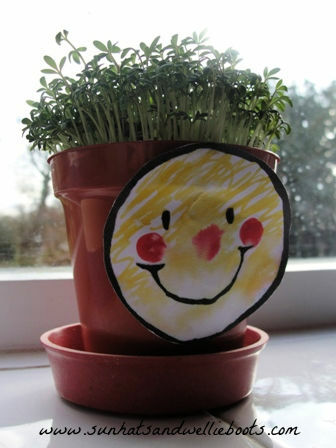 Sun Hats & Wellie Boots: Grow Your Own Funny Cress Heads! Grow Your Own Funny Cress Heads! Here's something to brighten your day. Cress Heads! So simple to make & guaranteed to make you smile. Watch the seeds as they grow & add a little water if the soil feels dry. The funny face will soon have funky green 'hair', just watch it grow. When it's time to give it a haircut, simply cut the cress with scissors, & then enjoy it in a sandwich or salad. A great activity to introduce seeds/plants to children, how to care for living things, to talk about what plants need to grow, & to encourage children to grow their own food.